Factual error: At the start Bruce Wayne runs into a massive dust cloud formed from the falling building. In the scenes that follow he and the other people have very little or no dust on them at all - they should be completely covered and choking on it. Continuity mistake: Superman gets his hair messed up during his fight with Batman, but while he is fighting Doomsday his hair is perfectly combed again. Character mistake: In the obituary for Clark Kent, the opening couple of paragraphs are repeated further down the article. Continuity mistake: When Perry asks Clark to do the sports note he has the paperwork in his left hand but in the next shot he is holding it in his right. Continuity mistake: After Batman shots the tracking device onto the truck, later in the warehouse the device is next to a number 5 that was not there before. Continuity mistake: After Superman and Doomsday kill each other, Superman is lying in Doomsday's hand with his eyes wide open. 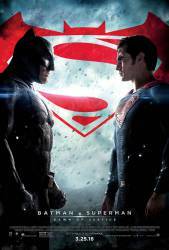 When Batman walks over to Superman and folds his arms over his chest a couple of shots later, Superman's eyes are now closed. Suggested correction: As Superman died, he closed his eyes off-camera. 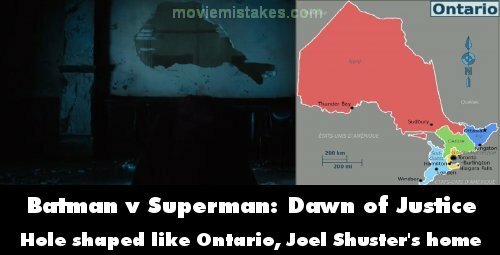 During the big fight between Batman and Superman, a broken window has the same shape as Ontario, in Canada. Superman creator Joel Shuster was born in Toronto. The broken window is only ever shown from Superman's angle, not Batman's. This was confirmed by Zack Snyder as being a deliberate, if obscure, easter egg.